Josh on the certainty of climate sensitivity | Watts Up With That? Are we now 95% certain? Yes, we are! Hooray! I was there to draw some cartoon notes. Here is my favourite. And here is the note I made when Marcel Crok, also at the meeting along with Nic Lewis, explained exactly what we are all 95% certain of. .. which is very good news, I think you will agree. We didn’t hear a lot of cheering but we did see a lot of graphs, and I made some notes. 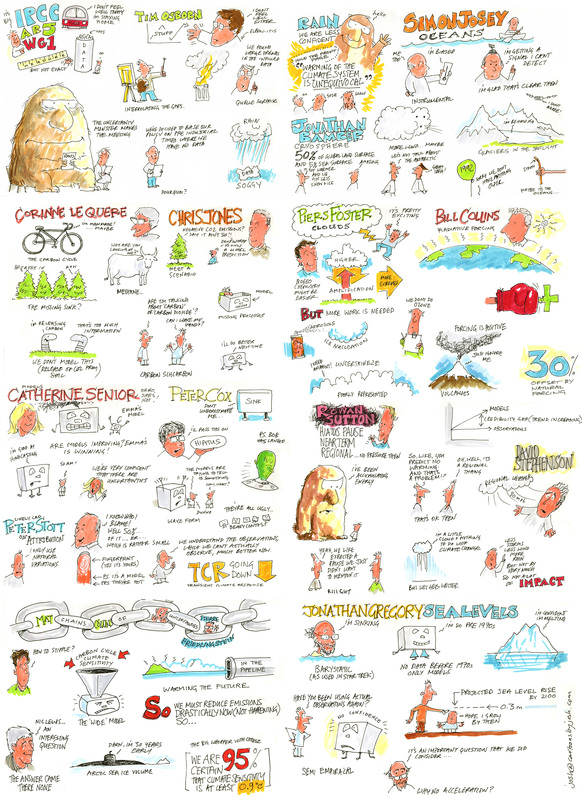 Click the image for a large readable version. 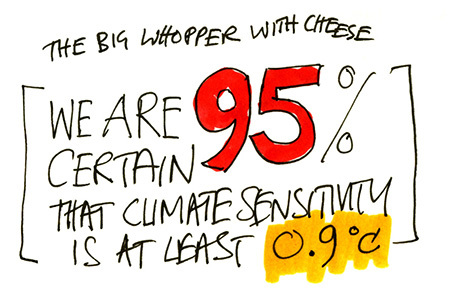 February 6, 2014 in Climate sensitivity, Humor, Satire. That’s the sound of your chain being yanked. So much for attachments! I’m getting little red “x’es” where there should be cartoons. Cartoons MIA? They look okay at Bishop Hill. Good one Josh. Suckered everyone! At the moment, here appears to be a “typo’ in that your cartoons didn’t appear. A more subtle dig at CAGW proof? Maybe the “stipple” should have been done using pointillism. I’ve updated the click through image with a local copy, the BH blog has some very weird ways of dealing with images that don’t work well externally. You’re welcome to delete them obviously. I was trying to help in the crux of time. The “95%” is the area under the curve of a posterior probability density function (PDF) between the limits of 0.9 C per CO2 doubling and infinity. This PDF does not exist unless the associated the associated non-informative prior PDF is unique. It isn’t. It is easy to show that non-informative prior PDFs are of infinite number. Each such prior PDF generates a different posterior PDF via Bayes’ theorem. A result is for the 95% confidence limit to vary rather than to be fixed at 0.9 C. This variability violates the law of non-contradiction. Non-contradiction is one of the classical laws of thought. Loved the “Uncertainty Monster,” Josh. And all the rest of it quite good. Thanks! Josh, thanks for the funnies! Which means that they are 95% confident that it is between 1 and 6 degrees per doubling of CO2. The warmists are running out of time. It is difficult to push the incorrect dangerous warming paradigm (dangerous warming due to the CO2 increase is not physically possible as the planet resists rather than amplifies forcing changes, sensitivity issue) when it becomes obvious the planet is unequivocally cooling due the solar cycle 24 interruption. The warmists can hide the decline in the proxy analysis; they cannot hide unequivocal global cooling. Winter of 2014/2015 is going to see the recovery of Arctic sea ice. Antarctic sea is currently at record for all months. 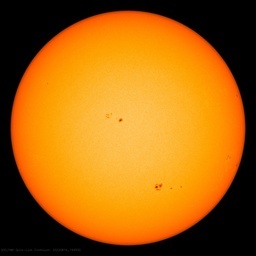 The solar cycle 24 interruption is the reason for the recurring La Niña. I’m beginning to think Josh is just humoring us. Thank you for sharing that FUN treasure trove of wit and humor, Josh. You are SO TALENTED! Loved the “Where’s Waldo” effect. I believe Someone in Australia did a study of deserts in Australia absorbing and releasing CO2. The study concluded that Australia is a net user of CO2, yet we have these fools still believing in an emissions trading scheme because we sell coal to China and Japan. Wow. 95% certain. What in life is that certain? A claim like that says to me that I can be 95% certain that whomever is making the claim, does not have a clue all the assumptions, measurements and calculations involved. What is 95% certain? If you believe global warming is 95% certain you are a fool. 95% certain. I’d like to see each of the segments of this worksheet enlarged and posted separately. And so would all of us, I suspect. Is there even ONE “scientist” out of the “97%” consensus that even has a clue about all of the various mechanisms and biological methods that cause the soil to release CO2 and what, when, how and why it is released? Years ago, and I means years as I am in my 70’s I learned that green plants depend on fungi to sprout, grow and LIVE. with out the fungi – NO green plants, trees, shrubs, grass, etc. They need to fungi to get water, nutrients, etc. and the fungi need the plants. and all of these are hidden under ground. Then both need bacteria, to grow and all three need each other. Go out in your garden and pull up a plant that is planted in good healthy loam. Around the roots you will find a sort of spider web or fishnet like mesh that you might think is part of the roots. It is actually a fungus that helps the plants grow. Yes some are harmful to some of the plants and dome plants don’t like others but there is a balance, and don’t all of these release CO2? 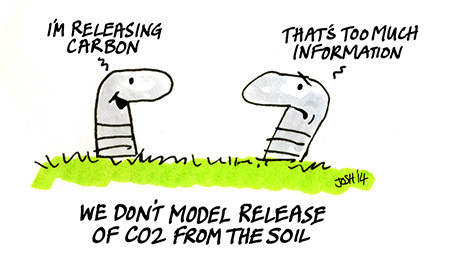 Last week I was reading a “NEW” study on how fungi in the soil released CO2 and that it had NEVER been considered in any of the AGW models. This strikes me about as smart as planning a trip to the moon and planning on using a compass to determined the course. Are we dealing with morons? And these “scientists” have a 97% consensus? B/S, they don’t even know what the think they know. Kind of reminds me of the story of the professor that studied and got higher level degrees specializing in a specialized topic. Eventually he knew everything there was about nothing at all. That is what we have – THE AGW group knows everything there is about nothing at all. It would be nice to know, how much erosion rises sealevel. Has anybody done any research about it? What a citation: “We’re very confident that there are uncertainties…” (Cathy Senior, 2014, IPCC, AR5, WG1). I guess she could have said this in her presentation? Fantastic poster, Josh and Anthony. – Every classroom should have one of these on the wall! Send one to Chazza also (The Prince of Wales). Our fossil fuel burning CO2 production is 3% of the TOTAL ANNUAL CO2 BUDGET. The rest is NATURAL. Stop worms farting now to save the planet. You are correct on the conclusion. However, the “97% consensus” paper has been has been dissected and debunked. There are numerous threads on this site and others which you could read for a better understanding of the underhanded methodology used to arrive at 97%. I’m 99% confident that they’re all rent-seeking charlatans. As of now this hypothesis has not been falsified. Which actually means that after all that money, they are 95% certain that it will either not matter, or be a calamity (or anywhere in between). Thanks for the settled scientific guidance chaps – think I’ll wait a bit and see what the data says. It is more like stating that there a 95% confidence that the force of gravity is greater than 20 meters per second squared and planning a trip to the moon. No wonder the models keep failing. Even 6° would not be a “calamity”. When the Earth is in “Hothouse mode”, it is about 10K warmer than now, and life booms, pole to pole.